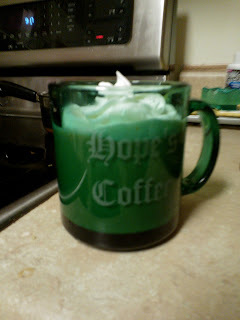 Hope's Cafe: Glasses With A Twist Engraved Mugs! I was able to choose 2 glasses from Glasses With A Twist for review. This is a unique store that offers various glasses, with optional engraving. You can choose a design on the site, or create your own design. 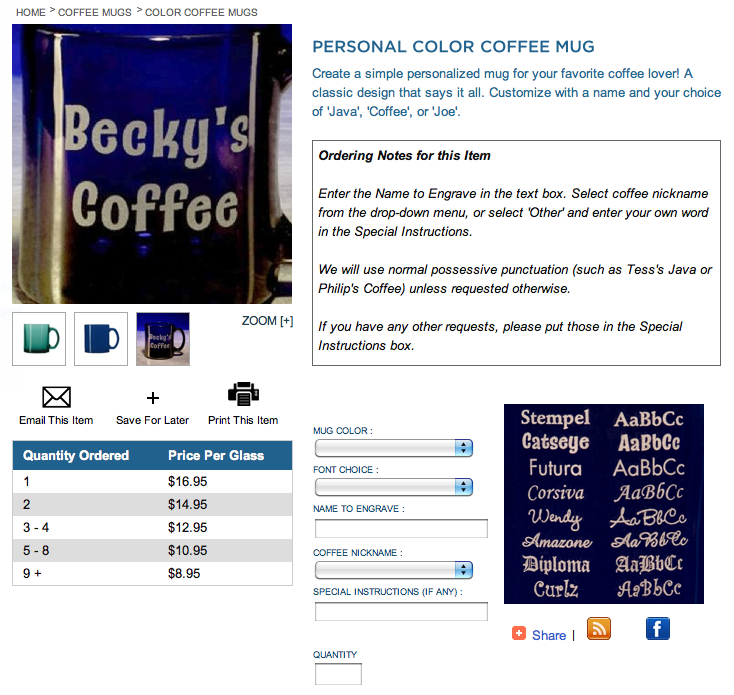 There are several different fonts available as well, so basically you can design the glass to your liking. After checking out the selection of glasses, I chose the green Coffee Mugs. One for myself, and one for J. After placing the order, it was a short wait before the package arrived. I was honestly impressed with the speedy delivery, as well as the super careful packaging. Both glasses arrived in great condition, with no nicks or bumps. I was expecting the mugs to be a fragile glass that required very careful handling. To my surprise, while they have a lovely, elegant appearance, they aren't that paper-thin glass that will shatter at the first bump! I love that! I used my new mug for a cup of coffee the very next morning, and the whole family thought it was great. And, when J's birthday arrived and he unwrapped his very own coffee mug, he was very happy! 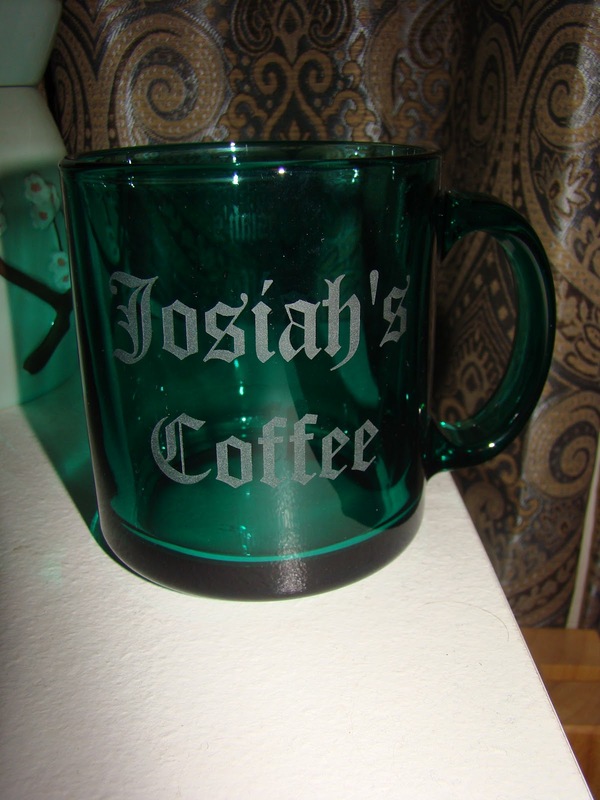 No more confusion over getting coffee mugs mixed up, or having someone use his favorite cup...now everyone knows exactly what cup is J's (and mine!). Need a unique gift for someone? Or are you just tired of not having that perfect coffee mug? Check out Glasses With a Twist today! Disclaimer: I was not monetarily compensated in any way for this review; I did receive product for the purpose of review. All thoughts and opinions are mine; all quotes taken from the Glasses With a Twist website. I was not required to post favorably about the product or company. What a great mug. I am impressed with all the choices you get for the personalization. And a perfect way for him to have his personal mug no one else can use! This would make a very nice and yet,unique gift that I'm sure anyone would love to have.Very nice quality mug.